Not long ago we talked about the best places to see the Northern Lights in Finland , map included. In that list of places Lapland was the top choice, since it’s the northernmost area of the country and lies north of the Arctic Circle. Nonetheless, knowing the best places alone is not sufficient to hunt down the Aurora Borealis. There is another factor just as important as the location: knowing the best moments to see the Aurora Borealis in Finland. Can’t I see the Aurora Borealis throughout the whole year? Since Finland is a Nordic country its winters have few hours of daylight. In some areas of Lapland, people spend several weeks in total darkness, with only a little bit of twilight visible over the horizon (they call it Kaamos, the polar night). In the same way, summers in Finland have few hours of darkness, and in some places you can see the Midnight Sun for weeks. As we mentioned, besides the need for a high latitude to see the Northern Lights, you should also be in Finland when there are several night-time hours. But to summarize briefly, we can say the following: between the end of April and the beginning of August there is simply too much light. In the next image, from the Finnish Meteorological Institute , we can see the number of nights with Aurora Borealis divided between the total number of Auroras per year. The blue line show us the Auroras that can be seen from the Polar Arctic Circle to the Arctic Ocean (the northernmost part of Finland). On the other hand, the red line shows the Aurora Borealis that happen from the South of Finland to the Arctic Ocean: they are more widespread since there are some hours of night during the summer in South Finland. When to see the Aurora Borealis: it all depends on the month. The best moments to see the Aurora Borealis are shown in the graphic. We can see that between August and September they are already visible. In October, November and December – the Autumn months – the northern lights season is already in full swing. The winter months – January, February and March – are perhaps the best ones, but it’s also important to remember that the cold is often too intense. In April, the Aurora Borealis start to fade, since there are too many daylight hours again. In May, June and July they can’t be seen at all, since there are almost no hours of night. One must take into account that the weather in Finland is very cloudy. Last winter – three months, 90 days – there were only 50 hours of light in total. On the equinoxes (the moment between Summer and Autumn in September, and the moment between Winter and Spring in March) the Aurora Borealis are easier to spot, since the skies tend to be very clear and almost cloudless. The Northern lights take place at a high altitude in Earth’s atmosphere, and therefore happen above the clouds. 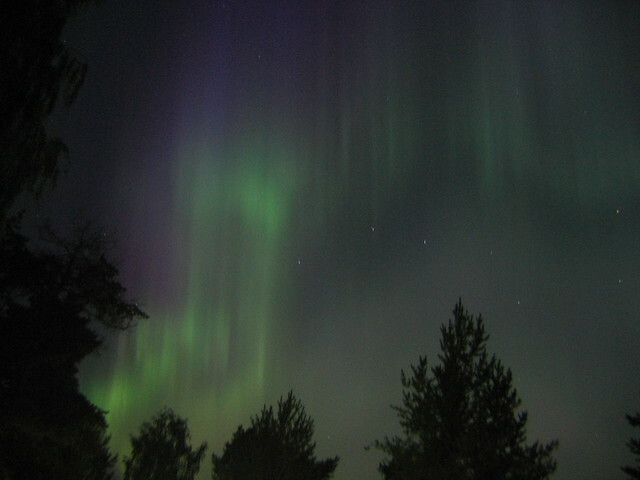 In the same way, the light of the Aurora Borealis is actually quite dim. They can’t be seen properly if there is light – for instance, city lights – around. Even a full and bright moon can affect their visibility. Statistically – and this is why Finland has a research center for the Northern Lights in Sodankylä, Lapland – it is easier to see Aurora Borealis at certain times. This graph shows us when to see Aurora Borealis on a given day: between 11pm and 12pm is the best time. Do you have some other advice on the best moments to see the Aurora Borealis? If you have seen it before, at what time and during which month was it?